In recent years there has been a gentle revival of Sullivan operas not having librettos by W.S. Gilbert. In May 1999 the BBC Music Magazine issued The Rose of Persia as its disc of the month (BBCMD81). The Gilbert and Sullivan Society of Edinburgh released an LP of The Chieftain and The Contrabandista in 1986. It was re-released on CD in 1999 on the Sounds on CD label (VGS204). The Emerald Isle appeared in 1982(Pearl SHE574-5) and was re-issued on CD in 2003 (Pearl GEMS 0189). In 2000 the Prince Consort of Edinburgh produced the first complete recording of Haddon Hall (review). It is interesting that George Bernard Shaw believed this to be the best of the Savoy Operas: apparently the work actually managed to overtake the box-office receipts for The Mikado. After The Gondoliers (1889) the composer collaborated with Julian Sturgis in his only ‘grand opera’ - Ivanhoe (1891) which was based on Sir Walter Scott’s tale. In 2010 the BBC National Orchestra of Wales conducted by David Lloyd Jones made the first professional recording of this opera on Chandos (review). It was a surprising success and received excellent reviews. So it is time that listeners had an opportunity to hear The Beauty Stone. What a surprise this work is. In spite of a problematic plot, Sullivan has contributed some of his most attractive music. I do not believe in giving the plot of an opera in a review: not everyone knows the story and some may wish to enjoy the unfolding tale. However, it is fair to say that the ‘book’ is a bit of a confection of Goethe’s Faust, the Brothers Grimm and Gothic Horror. The libretto is by Joseph Comyns Carr and Arthur Wing Pinero and was reworked from an old German legend. The main scheme surrounds the transformation of a disabled girl into a beauty and back again. Other characters in the opera discover that this ‘beauty’ is in the eye of the beholder. The tale is set in the small Belgian town of Merlemont at the beginning of the 15th century. 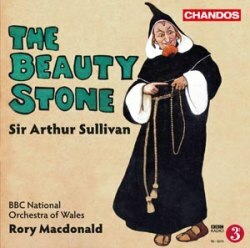 The Beauty Stone was first heard at the Savoy Theatre, London on 28 May 1898. However it was hardly a success, lasting for only fifty performances. The main critical concern was that the words were unworthy of the music. Furthermore, the length of the original production, lasting more than four hours, did not endear the work to audiences more used to the standard repertoire of ‘G&S’ operas. Much of the dialogue was subsequently cut. Some of the musical numbers were also excised to try to make the work more approachable. The present recording has restored the music but has wisely opted for not including the dialogue. I am totally impressed and convinced by the music. My thoughts are that this is an important rediscovery of some of Sullivan’s best work. The music lies between Ivanhoe as a full-blown grand opera and the better known Savoy operas. Sullivan had imagined this as a music-drama rather than a comic opera. There is still much of the wit that listeners associate with The Gondoliers and The Mikado, but there is a depth and intensity that goes beyond what the opera-goer typically associates with Sullivan’s music. This is subtle music that genuinely explores emotional depths and allows characters to develop. Any doubts I have about the plot are nullified by this beautiful score. It is not exaggerating to suggest that it is a masterwork. The booklet is a stunning production: it is a model of its kind. The text is given in English, German and French, so clearly Chandos feel that The Beauty Stone will have some reach beyond the shores of the United Kingdom. The liner notes are divided into a number of parts. William Parry has given an historical introduction to the opera. Martin T. Yates has provided a significant musical analysis which bears study. There is also an extremely detailed synopsis of the opera’s progress. However, one of the most important elements of these notes is the contemporary report from The Daily News (25 May 1898) which features an interview with Sullivan. Interesting illustrations include an original advertising poster by John Hassall, the programme for the opening night, and a number of photographs from the 1898 production of the heroine, Laine, before and after her transformation. The track-listings are conveniently tied into the libretto page. There are the usual notices of the principals, the BBC National Orchestra of Wales, BBC National Chorus of Wales and the conductor Rory Macdonald. Details of the Sir Arthur Sullivan Society are also included. My only concern is that the font is necessarily small: I read it on my computer from the PDF file. It seems superfluous to state that the sound quality of this recording is excellent. As with any opera, it can be difficult to balance orchestra, chorus and soloists. Chandos have done a sterling job. The enunciation of the principals and of the chorus is perfectly clear: I hardly needed to follow the libretto in order to understand the plot. The singing is unbeatable, with all the soloists entering into the spirit of the story. What impressed me most was the orchestra: so often G&S performances are marred by a necessarily pared-down band. The BBC National Orchestra of Wales make a major contribution to hearing this opera in ideal conditions. In recent years there has been an increasing interest in Victorian and Edwardian opera in general. Witness the revival of George MacFarren’s Robin Hood and William Vincent Wallace’s Lurline. The Beauty Stone makes a worthy companion to these as well as the other operas that Sullivan composed without the aid of Gilbert’s librettos. In spite of my reservations about the plot, I have to say that I was impressed by virtually every bar of this music. This is not second-rate Sullivan, but the Master at his very best.